The capital city of Himachal Pradesh, Shimla is a quaint little hill station nestled in the Shivalik hills. The city derives its name from the name of Goddess Kali, Shyamala. It was discovered by the British for a perfect escape from the scorching heat of the plains. Shimla offers the picturesque set of its treasured natural gifts to its tourists, such as, pine clad hills, beautiful valleys and waterfalls. Shimla has its own colonial charm too. 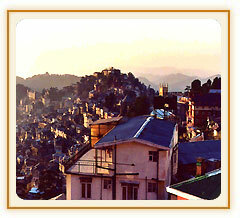 The Mall : The mall that runs along the Ridge is the hub of Shimla. It is always crowded with tourists. It is the city's most famous shopping center, with shops selling all items, from clothes to junk food. Rashtrapati Niwas : This six-storeyed Vice-Regal Lodge ( now Rashtrapati Niwas) was built in 1888 and was formerly the residence of Lord Dufferin, the British Viceroy. The style of architecture is English Renaissance and it has magnificent lawns. It presently houses the Indian Institute of Advanced Study. Scandal Point : it is the State Museum of Shimla. built in 1974, it has a good collection of statues, miniatures, coins and photos from in and around Himachal Pradesh. a statue of the national leader Lala Lajpat Rai has been erected here. Jhaku temple and Shymala temple : Jhaku temple is dedicated to Hanumanji, the loving devotee of Lord Rama. 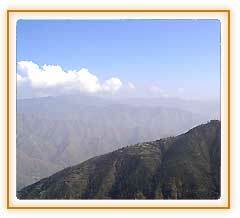 It is located near the highest point of the Shimla Ridge, and thus offers a panoramic view of the city. A temple dedicated to Shyamala Devi, an incarnation of Goddess Kali, is located near Grand hotel. Manali 40 kms. away from Kulu to the north, Manali is situated near the end of the valley on the National Highway leading to Leh. The landscape here is breath taking. One sees well-defined snow capped peaks, the Beas river with its clear water meanders through the town. On the other side are deodar and pine trees, tiny fields and fruit orchards. It is an excellent place for a holiday, a favorite resort for trekkers to Lahaul, Spiti, Kinnaur, Leh and Zanskar regions in Kashmir valley. It is known as the SWITZERLAND OF INDIA. 2 kms. from the town, club house has indoor games facilities which has been located on the left bank of Manalsu Nallah. There are some picnic spots near it. There are 3 newly constructed colorful monasteries, where visitors can buy carpets and other Tibetan handicrafts. Two are located in the town and one at Aleo on the left bank of Beas river. Located 3 kms. on the left bank of river Beas towards Kulu. This Institute organises basic & advance training courses, in trekking, mountaineering, skiing and water sports. Skiing and trekking equipments can be hired from here by booking in advance. Tourists can visit an interesting showroom here. Vashist, a small village located on the left bank of river Beas towards Rohtang pass is worth a visit. It is renowned for its hot springs and temples. Nearby is the pyramidal stone temple dedicated to Vashist Muni. There is another Temple of Lord Ram here. Natural hot sulphur springs with two separate bathing tanks for gents and ladies are always full of tourists. Turkish style showers fitted baths have also been built nearby. Hot water from the nearby spring is provided for bathing. 5 kms. on National Highway to Leh,a natural spring of cold clear water named after Pt. Jwahar Lal Nehru, who used to drink water from this spring during his stay in Manali. This spring is believed to originate from the Bhrigu lake situated high-up in the mountains. 13 kms. is a splendid valley between Solang village and Beas Kund. Solang valley offers the view of glaciers and snow capped mountains and peaks. It has fine ski slopes. The Mountaineering Institute has installed a ski lift for training purpose. Located here is a hut and guest house of the Mountaineering and Allied sports Institute, Manali. Now a few hotels have also come up. The winter skiing festival is organised here. Training in skiing is imparted at this place. Situated on the road to Rohtang pass, a picturesque spot, Kothi is 12kms. from Manali. A PWD rest house is situated on a ridge overlooking a narrow valley with a very good view of mountains and valleys. Large number of films (movies) have been picturised at this place and is the ideal resting resorts of poets, writers and the lovers of peaceful environs. 16 kms. on way to Rohtang pass. If one goes to Marhi on foot from Kothi from the old road, the sight of the falls is fascinating. It is a good picnic spot as well.